I was born in old Amarillo in 1958. I was reared on pork chops and hominy in the musky shadow of south Fort Worth, and I played with horned toads when I was little. Got the twang; got the fixin-to’s, and the y’alls. Yet somehow I’ve always suffered some vague pang of doubt about my standing as a genuine Texan—genu-i-ne with the long i, of course. I love Texas. Like a boy loves his ma. As with all native sons, I smile at her monumental achievements, dubious and otherwise. I secretly savor the downright contempt with which outsiders look upon Texas’s arrogance and pure audacity, even when it’s mostly myth. More correctly, that was what I was branded in school. Brands like that don’t rub off easily; by fifth grade, I had internalized the hateful label and suffered dearly for it. So, convinced that this was the root of my plight, this cowboy cognitive dissonance, I then came to realize that the first steps I took in proving to myself I was no coward was the day my dad and I got hopelessly lost deep in the bowels of the Shafter mines. Fight or Flee: Flee. Here in the land that glorifies the rugged maverick, the place where Colonel Travis gave the finger to the bullies in Mexican blue, I shrank from my childhood tormentors. I cried when my feelings got hurt. Not once did I raise my fists to the taunts. I ran away as fast as I could. I ran so fast and so far that I eventually qualified for the state track meet in the mile run my junior year in high school. Being a sissy in Texas is serious business. Rationalizations concerning discretion and valor notwithstanding, I spent my entire youth wishing that just once I had stood my ground. If only I had thrown even a single measly punch when Pete Trevino and his gang of thugs pushed my books out of my hands in elementary school. When the Grubbs boys knocked me down on the playground in sixth grade, I alone had the choice to respond in kind or wail like a hurt puppy. Sadly enough, each decision to run only produced more bullying. I became an easy mark. 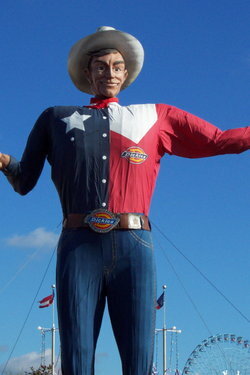 Here in the birthplace of the long, tall Texan, I was neither. So where did this come from, I pondered. What was the origin of my wimpiness? Occupied in some vague self-chastisement, listening to Kevin Bacon (yes, that Kevin Bacon) warble from my stereo about the indistinct obligation that is manhood, I came to know. I acknowledged, grudgingly, that every decision to fight or flee was mine. I discarded the psycho-environmental defenses and girded myself to admit the source of my passive ways: my dad, of course. Understand, it is the age of victims. Dad and I were never very close, at least not in the sense that I imagined fathers and sons should be. My memories of him from my early childhood are scant: a few still pictures of him coming home from work, leaving for work, polishing his boots for his weekends in the Army National Guard. My family was never without; Dad was a solid provider. Back then, that was about all dads were called on to do — provide. For as far back as I can reach in my mind, I remember Dad always working two jobs. He was seldom home, which left me at the mercy — and critical influence — of my two older sisters and my mom. Thus, I was vastly more learned in the town and country accessories of Barbie and Ken than the tactical gear of G.I. Joe. My sibling playmates and I squabbled over rules clarifications of Mystery Date, not Stratego. Body by Jake won’t do it. Dad worked for the United States Post Office for most of my youth. But by the time he and my mom began their years-long, agonizingly tender divorce process, he had moved from letter carrier to postal security to the U.S. Border Patrol. Along the way, I stumbled through adolescence bouncing from Burleson, Texas, to Tulsa, Oklahoma, to Kingsville to the bordertown of Presidio, and eventually back to Burleson. Although my stay in the baked huddle of homes that was Presidio lasted no more than the summer of 1976, it provided a defining moment in my life. During that summer, on a hot and clear July morning, Dad and I descended into oblivion together. I emerged many hours later a true Texan. Silver in the Chinatis. If I were to undertake a comprehensive listing of the folks to whom I owe gratitude for finding my cajones, I suppose I’d start with John W. Spencer. Approximately a century before Dad and I faced our moment of truth, Spencer, a West Texas rancher and amateur prospector, figured prominently in creating the subterranean world in which I would forge my mettle. Spencer was an industrious sort who, aside from ranching, made money selling cattle and goods to the U.S. Army contingent at Fort Davis. In 1880, during one sales call to the outpost, Spencer discovered a rock in the Chinati Mountains near Presidio that looked to be heavy with minerals. He showed his find to Colonel William R. Shafter, a cavalry officer at the fort. Shafter had the ore assayed for its mineral content. The report confirmed Spencer’s hunch: the stone contained silver. Shafter then persuaded two Army buddies to help him buy up as much of the land as they could in the vicinity of Spencer’s find. Thus began the boomtown of Shafter, Texas, some 18 miles north of Presidio. Colonel Shafter and his Army cohorts didn’t have the money or machinery to undertake a serious mining operation, so they sold their lots to a San Francisco mining interest, which began the Presidio Mining Company in 1883. Fast car won’t do it. From 1883 to 1942, some 33 million ounces of silver, worth around $20 million, were extracted from the Presidio Mine at Shafter — the most silver ever mined in Texas. By some accounts, the Shafter mines produced roughly 92 percent of the silver and 73 percent of the gold mined in the state. At its apex, Shafter had more than 1,500 residents; it boasted two saloons, a dance hall, post office, and school. The mines closed and reopened periodically through the years, riding on the market price of silver. With the exception of a few attempts at resurrection, the Shafter Mining District effectively ceased operations at the beginning of World War II. When nearby Marfa Army Air Field and Fort D.A. Russell were decommissioned after the war, the few remaining businesses in Shafter packed it in. By 1949, the town’s population hovered at around 20, and Shafter began to fade into Texas ghost town lore. By the time Dad and I got there, the only living beings I saw in Shafter were an old woman and an ornery calico cat named Schmuck. Earth-moving Critters. I was 17 in the summer of 1976, and my parents had already divorced once. For some reason, they believed a reconciliation could be effected in the overwhelming heat and solitude of life on the Mexican border. Dad was fresh out of the U.S. Border Patrol Academy then, and as low man on the pole, he was assigned to Presidio. I had stayed with my oldest sister to finish my junior year at Burleson High before joining my folks. Where they saw hope, I saw only dust, and jackrabbits, and enormous bugs. I was a boy of the suburbs, and I figured I had no business being in the land where Pancho Villa roamed. Much smaller than its sister city of Ojinaga on the Mexican side, Presidio was the most isolated collection of dwellings I had ever seen. The Border Patrol agents lived on “government hill,” a circle of pier-and-beam frame homes on a dusty knob of land overlooking the town. My most vivid memories of our house involved insects. At night, I would kick over the sandy-white rocks under the streetlight at the edge of our dirt lot. Without fail, I would unearth gigantic beetles (as long as my middle finger from pincers to rear legs) millipedes, spiders, tarantulas, and fantastic multi-legged black creatures that clicked and snapped loudly when they walked. Once while I was throwing a tennis ball against the house, I aimed too low and watched the ball disappear into the darkness underneath. When I stooped to investigate, I was met by a large ink-black spider, with a smooth bulb of an abdomen about the size of a fat, ripe cherry. When it turned in its web to face me, the distinctive orange hourglass on its belly warned me off. I gave up my ball as lost. The night crawlers would be child’s play, however, by the time my summer was over. 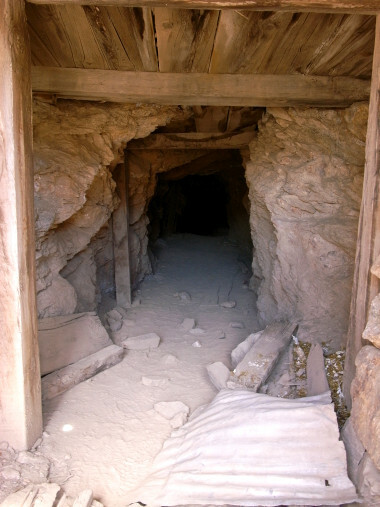 Dad had told me one day that there were historic old mines in Shafter. I still don’t recall who actually brought up the idea of exploring them, but I remember that my mother was against it. Dad said we’d just poke around them for a little while. I’d never heard of any serious mining in Texas in all my seventeen years, so I concluded that these couldn’t be too extensive. As was the case with many of my parents’ disagreements, Dad won the argument but Mom was proven right in the end. A Dot of Civilization. It was a clear summer Saturday with a pale blue sky. The day’s high would be easily over 105, as most of them were, so we dressed lightly — in short sleeves. I was going to wear shorts, but Dad suggested long pants in case we had to climb or crawl. We didn’t give a thought to provisions; we’d be back by afternoon. We brought along two household flashlights. Dad honked the horn of his little yellow Pinto, and he and I waved at my mom. She could only shake her head as we drove away. Dad mentioned to me that portions of the movie “Andromeda Strain” had been filmed in Shafter. I had seen the movie with my friends in the now-defunct 1849 Village Theater in south Fort Worth some years before. I loved the movie, and my buddies and I quoted lines from it for weeks. We would greet each other with a cryptic “601,” which was the movie’s computer code for critical system malfunction. On U.S. 67 nearing Shafter, Dad pointed out the profile of Abe Lincoln in the Chinati Mountains to the west. Dad said he’d read that the exposed volcanic rock in the Chinatis was among the oldest in the Southwest, estimated at 32 million years. We slowed into Shafter, a sparse mix of deserted shacks and a few still-occupied homes. Jagged ruins of small stone buildings jutted up from the land like broken teeth. It appeared uniquely incongruous, a dot of civilization planted smack in the middle of the Texas badlands. Armani suits won’t do it. Dad pulled off the two-lane graytop of U.S. 67 near a small, squarish structure. It was covered by a patchwork roof made of corrugated sheets of steel; a Coca-Cola sign, with the faded words “Carrillo’s Place,” announced that it was a store — or had been once. From my vantage point in the Pinto, I couldn’t tell if the store still functioned. Dad stopped at the Shafter Post Office, a weather-cracked stone house, and walked over to a trailer home behind it. While he talked with a woman who had emerged from the trailer, I surveyed what I could of Shafter. Director Robert Wise had transformed this place into the fictional town of Piedmont, Arizona. The skinny steeple of Shafter’s old church provided the dominant landmark, and I recalled it from the movie. Some buildings looked long forgotten, left to decay by men who rode horses and wore bandoliers. Other structures appeared to have been abandoned only yesterday, by people in a great hurry to return to the city life. The entire town of Shafter looked absolutely still. I got out of the car and tried to make friends with a fat calico cat sitting in the shade. The woman hollered at me that it was best not to fool with old Schmuck, so I left it alone. Surely a product of his environment, Schmuck was stoic and ornery-looking. The woman pointed us west, across the road. We gathered our flashlights, and Dad took off his watch so it wouldn’t get scratched in our explore. 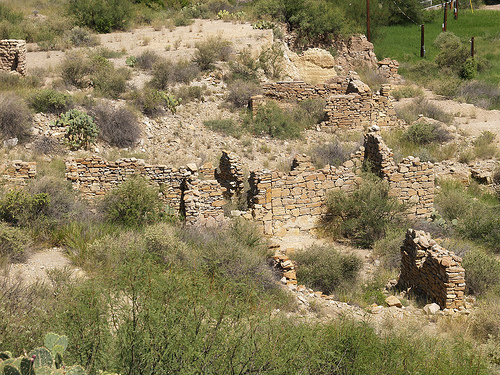 We crossed U.S. 67 on foot, walking away from the town and into the skeletons of the Shafter Mining District. It was a good uphill hike into the high desert. We topped a long, sloping hill of rock and cactus and then walked down again, eventually losing sight of the road. The blanched beige-orange earth was parched from numberless years of relentless sun. The morning was already hot. We passed a cluster of tall, rusted water tanks and long-abandoned machinery of some sort. Here and there were huge nuts and bolts, barrels, large pieces of derelict equipment, and sun-bleached railroad ties. Dad told me that this was once considered the richest acre in Texas. Now it was wasteland. Going Down. The desert landscape of the surrounding mountains was harsh and beautiful, but I learned soon enough to keep my eyes on the ground. Without so much as a signpost or an orange ribbon of warning, a great hole opened up before us. The hole was roughly rectangular, about as big as a refrigerator. It shot straight down into blackness. I was fascinated by this unmarked box of unfathomable depth. We got on our hands and knees to approach it, positioning our faces over the void. The very feel of the air — an occasional upward draft of stale coolness, the long silence between echoes — spoke of passageways deep within the earth. I found out years later that the Shafter mines form an underground honeycomb that extends for miles — a fact best digested in hindsight. No serious mining in Texas, indeed. Dad surmised that the hole was an air shaft. We took turns dropping rocks into it and listening to their extended freefall. It was breathtaking. We found a good-sized boulder, one that took both of us to lift, lugged it to the shaft, and pushed it in. As the void swallowed the stone, the rush of air was frightening. We counted off the seconds before it hit bottom; the echoes grumbled like thunder. We felt the sound in our bones. And the teacher won’t do it. We made our way down and around a slope of rock and brush and found ourselves amid an odd mélange of openings in the mountainside. Some were large enough to walk into without stooping. We turned on our flashlights and immediately began exploring the larger horizontal shafts at random. We entered cautiously at first, eyeing the earthen floors and ceilings as we walked. The first few shafts we tried dead-ended in solid rock after only a short distance. One shaft, however, led us to a tunnel running perpendicular; we took the crossing path, and the air immediately became cool and musty. The walls of rock were numbered with what looked like red paint at each intersection. I distinctly remember glimpsing the sunlight from the opening of our shaft behind us as we walked. I didn’t know it would be the last I would see of the sun for a long time. This One’s for Pete. Our spirits were high. We joked about finding a forgotten vein of silver. The tunnel we were in took us fifty to sixty paces and then turned again. With each tunnel, we noticed a gradual downward slope. We were walking into the belly of the earth. Just beyond the juncture, Dad, who was ahead of me, stopped and told me to look. I followed his flashlight beam and stood shocked for a moment. It was apparently the carcass of a goat. Laying on its side, the animal was pinned to the ground by a huge chunk of stone that had dislodged from the ceiling. The carcass was part skeleton, part leathered remains. Its neck was craned, reaching toward its hindquarters. It died trying to chew off its leg to get free, Dad said. How long the animal lay there in the darkness we couldn’t begin to guess. We took the turn at the juncture of tunnels and found ourselves in a noticeably more cramped tunnel. At another intersection, we left the smaller passage for a roomier one. The air was humid here, almost moist. Farther along, we were halted by a large vertical shaft. Our passage ahead was severed by a five-foot expanse of nothingness. No floor, no ceiling. I bent over the shaft and pointed my flashlight down. The narrow column of light was puny, no match for the darkness below. I looked up and saw a rectangle of light far above us, probably fifty feet or more. We agreed that it was likely the shaft we’d seen on the surface. It was hard to believe we were already this far underground. Dad suggested that we could jump it. My laughter trailed off when I saw that he wasn’t kidding. I was instantly terrified. The cool gusts from the blackness below us breathed suddenly of death. I wondered how many bones of goats and jackrabbits and coyotes were down there, hidden testaments to the errant step. I wasn’t sure if Dad’s soft chuckle was at my horror or the absurdity of his plan of action, but the sound of it roused me. It mutated into the snickering of Pete Trevino, daring me to parry his taunts. Strictly speaking, it was an easy jump; a gap, really, that required only a short run-up. But it was the consequences of failure that sent my heart throbbing so hard it hurt. I gave Dad a look like I was going to punch him, and I motioned him to get out of the way. Then I jumped it. The actual mechanics of the runway and takeoff I honestly don’t remember. It was a moment blurred by terror and adrenaline. Somewhere in that instant of flight, however, I socked Pete Trevino square in the jaw. The laughter ended with my landing. Door No. 1, Door No. 2 . . . Dad voiced his approval, then he ran and jumped the shaft to join me. We continued our trek with the hubris of men such as Byrd and Hillary. Farther along, at a three-way intersection of tunnels, we spied one lone bat hanging from the ceiling, apparently asleep. We walked under it, our heads just inches from the creature. The bat’s face was like a slumbering gargoyle’s, hideous and attractive. When the tunnel Dad chose ended in a wall of earth, we backtracked with me in the lead. I crossed delicately under the bat again and headed down an intersecting path. I had assumed Dad was right behind me, but he had stopped to inspect our sleeping host. I heard his voice behind me telling me to duck. I thought Dad was kidding, and I waved him off. When he warned me again, I turned. In the scant light, I didn’t see the bat; its wings brushed my ear as it flew by. I could smell it as it passed. It smelled like wet dirt. With me in the lead, we followed the bat’s path to yet another juncture. From there, we headed down a steep grade for a while and eventually found ourselves standing in a circular room of stone. It appeared to be a foyer or staging area of some kind. Tunnels opened in several directions ahead of us. The numbers and letters crudely painted in red on the walls beckoned us to choose. We sat for a brief respite in the stone room. I was surprised by the haphazard arrangement of the tunnels. I had expected a grid pattern or some form of rigid design. These paths meandered, carved seemingly on a whim. We shut off our flashlights and felt the blackness fold over us. It was a quality of darkness no closet could match. We were getting hungry for lunch and decided it was time to head back. As we retraced our steps, we hesitated at the first tunnel intersection. The silent doubt passed between us. Neophyte spelunkers, we hadn’t recorded our path. We both had a keen sense of direction, but we had taken many turns. And down here, the position of the sun was irrelevant. We joked at our confusion and pressed on. Dad took the lead, apparently honed in on the beam. We walked in silence, our minds distracted by the possibility of ending up like that goat, all leathered carcass and bones. Eventually, we recognized the three-way juncture where we’d encountered the bat, but beyond that I was dumbfounded as to the way back. 601, 601 . . . At one juncture, we knew we’d taken a wrong turn when our way ended in a clot of enormous stones and splintered timber. It was impossible to tell how long ago the tunnel caved in here or if it was in danger of further collapse. We had no inclination to find out. It was here, backtracking from the cave-in, where Dad fell. He was walking behind me when he lost his footing on some gravel. He wasn’t hurt bad, but his flashlight had landed with a loud pop. Dad’s light went out. I helped him up and teased him some about his clumsiness. I had assumed, as had he, that the batteries had fallen out of his flashlight. Upon investigation, we discovered that the bulb was smashed. I gave Dad my flashlight, and he took the lead again. Unlike airplane crashes and tornadoes, becoming lost is a gradual disaster. With each passing moment, another layer of dread and unease settled over us in those cool, dank corridors. Down to one flashlight, encountering one unfamiliar tunnel after another, we eventually came to the conclusion that we were lost deep inside the West Texas desert. As we hiked, we spoke only briefly, suggesting routes, discussing strategy, for what must have been hours. Somewhere along the way, we abandoned our hopes of finding our exact route back and simply began taking routes that went uphill. Our logic was that at some point we’d have to stumble upon the surface. I’ll try and make you understand. Dad began turning off the flashlight at intervals so we could scan for daylight. At one point, we came upon an expansive slope covered with gravel and various sizes of broken rock — a manmade alluvial plain. We scaled the wide slope only to find another air shaft, plummeting into the earth. We backtracked again and tried another route, our way punctuated with bits of utter blackness as we strained for any sign of light. Nothing looked familiar. Finally, Dad stopped and handed me the light. He said my guess was as good as his. There wasn’t fear in Dad’s voice, but I recognized the tone. We were in trouble. The flashlight weighed heavy in my hands. I tried not to think of our chances if I dropped it. And again I heard the snickers. The Grubbs boys smirking, enjoying my helplessness. The twisting knot in my stomach was the same old sixth-grade distress. I remember clearly the effort, the deep struggle to hold my emotions in check. I silently wondered if it was evening yet, if Mom had the sheriff’s department and Dad’s Border Patrol colleagues searching this deserted labyrinth for us. I didn’t know where we were when we saw it, and I surely could never find that tunnel again — if I was foolhardy enough to go back into that world. But somewhere in the Shafter mines, during one grave interval of blindness, we saw daylight. An exquisite yellow shaft of salvation. We zeroed in on it, but getting to the daylight wasn’t as easy as spying it. The mines weren’t ready to let us go yet. We encountered another dead-end. This time, the way became smaller from ceiling to floor as we neared the terminus. By the time we touched the solid rock that marked the end of the line, we were crouched, as if tying our shoes. The tunnel’s support beams on either side here were broken, snapped by age and the relentless weight of the mountains above. As if to taunt us, a handful of rocks and earth dislodged from the ceiling as we debated our next move. We hit the floor, jolted with fear. The mines were chuckling at us. We backtracked for another half-hour, trying to decipher the way that would take us to the elusive patch of light, which by now we were sure was growing darker. We realized a time element to our predicament. Finding our way out would be next to impossible in the black of night. We came to another air shaft. My decision to jump it took much less deliberation than before. I felt strangely proud that Dad had me wait up while he gathered himself for the hurdle. At the intersection ahead, the tunnel walls were alive with flickers of light and shadow. We practically ran toward the new tunnel. The light grew stronger as we turned right, jumped a fallen beam, and turned again at a sun-soaked opening. Dust and dirt particles in the air shined like flecks of gold. In a matter of minutes, we were out, and I had led the way. Dad and I broke into great peals of laughter, our sober predicament suddenly evaporated. We slapped each other on the back, and I looked back at the mouth of the tunnel. It felt good to be the one laughing this time. It was late afternoon when we emerged, the sun just beginning to dip below the Chinati peaks to the west. Amazingly, we were less than a quarter-mile from where we had entered. There were no sheriff’s deputies or patrol agents scouring the mountains for us. In fact, we weren’t even late for supper. With his stock understatement, Dad said he could use a cold one. I hitched up my jeans and spat on the ground. This story is absolutely true. I’m married to a good woman now and have two adorable daughters in Austin. My mom and dad got divorced yet again; Mom lives in Fort Worth, and Dad retired to a town outside of San Diego, California. Dad passed away September 23, 2010. • Kevin Bacon and John Belushi were both in the movie “Animal House” in 1978. Bacon played fratboy Chip sitting in the booth opposite Belushi when Belushi, as Bluto, impersonated a zit. • Belushi was also in the flop “1941” the next year, in which he played Captain “Wild Bill” Kelso. Also starring in that movie was Warren Oates (as Colonel “Madman” Maddox). • Oates was in the cult movie “Two-Lane Blacktop” in 1971. Oates played the man driving the souped-up GTO, the asphalt rival of James Taylor and Dennis Wilson in their black Chevy. • Also in “Two-Lane” was George Mitchell, who had a bit part as a truck driver who came upon an accident scene on the highway. • Mitchell also played “Gramps” Jackson, the cantankerous, sterno-drinking old man who survived the “Andromeda Strain” (1971) because of his wacked-out blood composition. • In “Andromeda Strain,” the fictional town of Piedmont, Arizona, where the space germ turned virtually everyone’s blood to dust, was played by the Texas ghost town of Shafter. So Kevin and I are like this, man. Thick. Roger White is a writer and editor living in Austin. Great story! You told it really well – glad you made it out of the mine to become a writer. I love this story. My brother is going to start working Monday at the Shafter mines. My dad was also a Border Patrol agent and his first duty station was Sierra Blanca and then it was on to Van Horn, Eagle Pass, Corpus Christi and then Del Rio.